Schoolboy wizard Harry Potter has been named the greatest screen fantasy hero of all time in a poll. JK Rowling's creation came in well ahead of the cyborg star of Terminator 2 and Buffy the Vampire Slayer in the UK Sci-Fi Channel poll of 1,500 people. 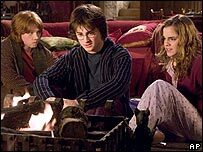 The latest Harry Potter film, The Goblet of Fire, has its world premiere in London this Sunday. Darth Vader, the monster from the Alien series and Star Trek's The Borg were named the greatest villains. The new Harry Potter film is the fourth time actor Daniel Radcliffe will be seen in the leading role. A fifth outing, Harry Potter and the Order of the Phoenix, is scheduled for release in 2007. The poll was commissioned to mark the UK Sci-Fi Channel's 10th birthday on Tuesday. "It's great that a home-grown icon has been voted the greatest hero," a spokesman said. Spiderman, Doctor Who, Han Solo, Neo from The Matrix, Spock, Yoda and Batman made up the heroes list. The villains list also included the Daleks, The Joker, The Terminator from the first Terminator film, Predator, Ming the Merciless from Flash Gordon, Lex Luther and Hal 9000 from 2001: A Space Odyssey.